McCloskey International has introduced a 36” x 100’ VBIN desegregating telescoping stacker, which will make its debut at CONEXPO/CON-AGG 2017 March 11-17 in Las Vegas, NV. This is the third product introduced in a growing line of self-contained desegregating conveyors to enhance and streamline materials handling. 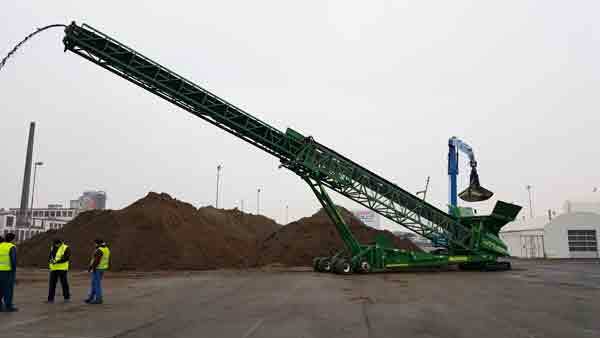 The new SDX100 VBIN is the first self-powered telescoping stacker in North America, with an onboard diesel engine. Available with either powered wheel or track drives, the SDX100 VBIN is highly mobile and easily transported from site to site. The new stacker desegregates and maximizes stockpile capacity using a robust, fully automated and highly flexible CAN based control system providing optimal control of material quality. It is more than capable of 750+ TPH in applications like barge loading, desegregating, offloading in tight quarters, or stockpiling materials. The VBIN section itself features hydraulic fold and boasts a standard capacity of over 7 yd3. In order to deal with shock loads of 10 tons and more the direct load stacker uses a heavy duty build and includes tightly spaced impact rollers, heavy duty 3 ply belting and reinforced frame. On-site setup from truck to stockpiling can be accomplished in 15 minutes. The design of the SDX-product range reflects feedback from customers in a cross-section of applications and industries, and McCloskey International’s commitment to deliver the best products based on that input. “Talking to our customers and gathering their feedback is what allows us to continually evolve our products. Based on this the SDX100 VBIN will deliver higher production, more versatility, and the reliability that our customers expect. We will always look at new and innovative ways to develop our products to meet the unique challenges of projects around the globe,” said Paschal McCloskey, President and CEO of McCloskey International.